At a moment when the ePortfolio has been recognized as a high impact practice – as a unique site for hosting student integrative learning and as a powerful genre for assessment – this book provides faculty, staff, and administrators with a set of frameworks and models useful for guiding students in designing and creating ePortfolios that clearly communicate their purpose and effectively use the affordances of the medium. 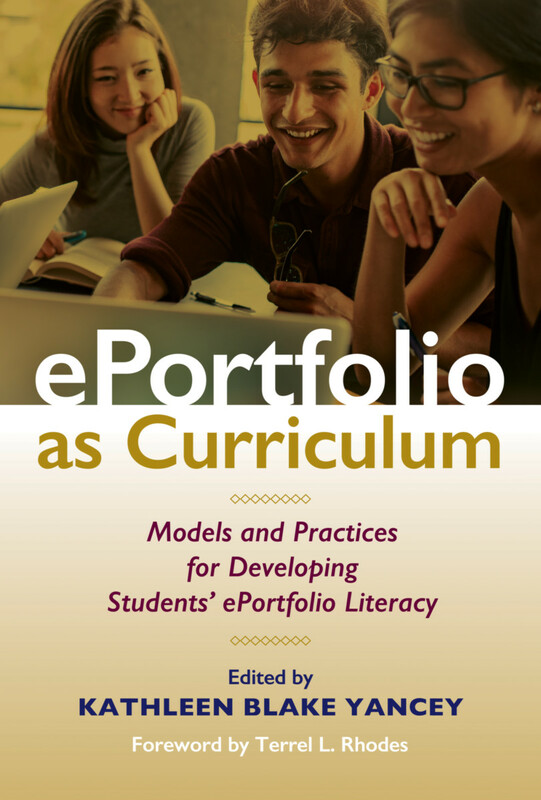 In short, this book both illustrates and provides guidance on how to support the development of students’ ePortfolio literacy. The ePortfolio curricular models provided in ePortfolio as Curriculum include both those integrated within existing disciplinary courses and those offered through credit-bearing stand-alone courses. In taking up questions focused on what students need to know and do in becoming informed, effective ePortfolio makers, the contributors to this volume – from the standpoint of their course outcomes and institutional contexts – present various approaches to developing an ePortfolio curriculum. Individually and collectively, the chapters explain ways to engage students in understanding the potential purposes, structures, audiences, and designs of ePortfolios; in developing the reflective practices for contextualizing and informing the selection and curation of artifacts; and in creating appropriate focus and coherence. Synthesizing insights from the previous chapters, the concluding chapter identifies six consistent features of an ePortfolio curriculum that support the development of students' ePortfolio literacy. In addition, Kathleen Blake Yancey identifies and defines seven common ePortfolio curricular dimensions that contribute to students' ePortfolio literacy, among them student agency, digital identity, and campus and global citizenship. Not least, she describes new practices emerging from ePortfolio curricula, including new ePortfolio-specific genres; new metaphors used to characterize ePortfolios and their practices; and new issues that the ePortfolio curriculum raises. "Excellent! In ePortfolio as Curriculum, master teacher/learner Kathy Yancey curates a richly fine-grained collection, zooming in on the exciting ways that today’s faculty – and students – use one of higher education’s most transformative practices. Provocative and satisfying. First rate!" "As e-Portfolio implementation comes of age this very timely volume focuses firmly on students as ‘ePortfolio-makers’ - as opposed simply to ePortfolio users. It offers rich and detailed insights into pedagogic practice and cogent rationales for such practice which empowers students as they construct, integrate and make accessible their Portfolios - and themselves learn from their learning over time. Staff learning is writ large here to; so I’ll be delighted to add this to my bookshelf." "Electronic portfolios have developed into exciting acts that in their creation yield, as one author says, “pivotal learning moments.” New digital capabilities, in fact, draw ePortfolio readers into that learning process so that creators and readers both increase and continue learning. Through this book’s analysis of theory and practice in a breadth of collegial contexts, readers can expand their knowledge of ePortfolio capabilities as processes for learning. I highly recommend this informative and inspiring book." Kathleen Blake Yancey is Kellogg W. Hunt Professor of English and Distinguished Research Professor at Florida State University. She has focused her research agenda on portfolios for the life of her career. In 1992, she published Portfolios in the Writing Classroom; in 1996, the co-edited Situating Portfolios, in 2001, the co-edited Electronic Portfolios: Emerging Practices in Student, Faculty and Institutional Learning; and in 2009, the co-edited Electronic Portfolios 2.0: Emergent Research on Implementation and Impact. She has served on the AAC&U VALUE Steering Committee and on the Board of Directors for the Association for Authentic, Experiential and Evidence-based Learning (AAEEBL), and she is a faculty member for WASC’s Assessment Leadership Academy and a mentor for WASC’s Community of Practice project. Yancey has also been the president or chair of several writing studies/literacy organizations, including the Council of Writing Program Administrators (CWPA), the Conference on College Composition and Communication (CCCC), and the National Council of Teachers of English (NCTE). Immediate Past Editor of College Composition and Communication, and past co-editor of the journal Assessing Writing, she has published over 100 refereed articles and book chapters and authored, edited, or co-edited 15 scholarly books, most recently Writing Across Contexts: Transfer, Composition, and Sites of Writing; and A Rhetoric of Reflection. She has been recognized with several awards, including the CWPA Best Book Award, the CCCC Research Impact Award, the FSU Graduate Mentor Award, the FSU Graduate Teaching Award, and the CCCC Exemplar Award.